Mina Nishimura presents two distinct works inspired by Tatsumi Hijikata. In Princess Cabbage, fantastical and grotesque images from Hijikata’s biographical novel Sickened Primadonna are playfully transformed into movements, vocals, and facial expressions crystallizing in a single body like a kaleidoscope. Quiet House, Ash Daughter is a quartet that explores a nuanced, personal, and collective internal landscape using recomposed texts and images from Hijikata’s butoh score. As the audience sits in the center of the floor, performers surround them with an elusive, moving painting, looking to each other for a sense of sympathy and conspiration. Tokyo-born Mina Nishimura was first introduced to butoh and improvisational dance through Kota Yamazaki’s teaching while studying at the Merce Cunningham Studio. She was an Artist in Residence at Brooklyn Art Exchange in 2010-11, at Chez Bushwick in 2013, and is currently an Artist in Residence at Movement Research. Nishimura teaches at Bennington College (Vermont) and Ferris University (Japan). 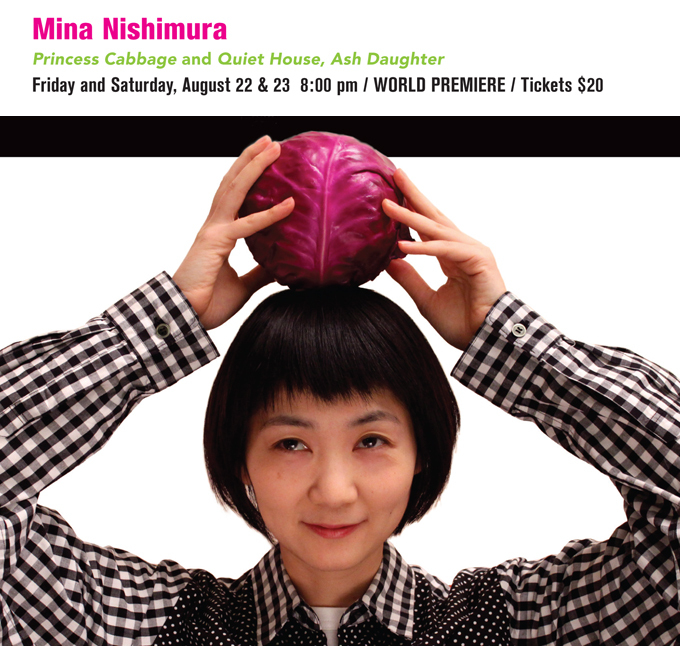 Support for Mina Nishimura's Princess Cabbage and Quiet House, Ash Daughter is provided by The Japan Foundation New York's Grant for Arts and Culture.